Wanderers led when Gary Madine knocked down Josh Vela's corner into the path of Darren Pratley, who headed in. Rangers pressed hard for an equaliser and were finally rewarded thanks to Sylla's flicked finish from Luke Freeman's cross. Newcastle United loanee Adam Armstrong drilled an early shot over the bar, and was then sent clear by Madine's flick, but Hoops defender Pawel Wszolek recovered to make a last-ditch challenge. Ian Holloway's side started the second half on top with Jamie Mackie's header forcing Jak Alnwick to save, but clear chances remained few and far between. The visitors, who have scored a single goal in each of their past nine visits to Bolton, increased the pressure, with Sylla's flick forcing a good sprawling save from Alnwick before finding the net when he repeated the trick from Freeman's sixth assist of the season. "It was a difficult game and the conditions played a massive part, but we adapted well first half. It was a good, solid performance. "I feel that from where we were prior to the Sheffield Wednesday game, four points from six, we would have taken that. "Of course there's some frustration because when you're 1-0 up you feel like you should keep hold of the lead, but we don't look like a team who are short on confidence any more." "They got two free headers in our box and scored. Our players should have dealt with it, but it was against the run of play. "In the second half I thought we were very professional. I want them to have more belief in themselves, and with the stats on what we created, we're more than happy with that. "I think after our goal, there was only one team that was going on to win it and I think any Bolton fan watching would agree." Attempt blocked. David Wheeler (Queens Park Rangers) left footed shot from the left side of the box is blocked. Assisted by Conor Washington. Attempt missed. David Wheater (Bolton Wanderers) header from the right side of the six yard box misses to the right. Assisted by Filipe Morais with a cross following a corner. Corner, Bolton Wanderers. Conceded by Alex Baptiste. Attempt blocked. Filipe Morais (Bolton Wanderers) right footed shot from outside the box is blocked. Assisted by Gary Madine with a headed pass. Attempt blocked. Craig Noone (Bolton Wanderers) left footed shot from outside the box is blocked. Foul by Alex Baptiste (Queens Park Rangers). Offside, Bolton Wanderers. Andrew Taylor tries a through ball, but Gary Madine is caught offside. Substitution, Queens Park Rangers. David Wheeler replaces Idrissa Sylla. Substitution, Bolton Wanderers. Adam Le Fondre replaces Josh Vela. Attempt missed. Jake Bidwell (Queens Park Rangers) right footed shot from outside the box is too high. Attempt blocked. Luke Freeman (Queens Park Rangers) right footed shot from outside the box is blocked. Assisted by Conor Washington. Goal! 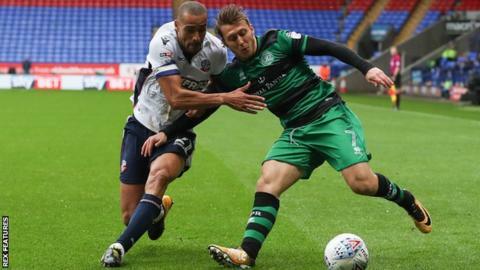 Bolton Wanderers 1, Queens Park Rangers 1. Idrissa Sylla (Queens Park Rangers) left footed shot from the centre of the box to the bottom right corner. Assisted by Luke Freeman with a cross. Corner, Queens Park Rangers. Conceded by Filipe Morais. Alex Baptiste (Queens Park Rangers) wins a free kick in the defensive half. Attempt missed. Josh Scowen (Queens Park Rangers) right footed shot from outside the box is close, but misses to the right. Attempt blocked. Matt Smith (Queens Park Rangers) left footed shot from the centre of the box is blocked. Assisted by Pawel Wszolek. Corner, Queens Park Rangers. Conceded by Karl Henry. Corner, Queens Park Rangers. Conceded by Mark Beevers. Attempt blocked. Josh Scowen (Queens Park Rangers) right footed shot from outside the box is blocked. Assisted by Pawel Wszolek. Corner, Bolton Wanderers. Conceded by Joel Lynch. Attempt saved. Idrissa Sylla (Queens Park Rangers) left footed shot from the right side of the box is saved in the bottom right corner. Assisted by Luke Freeman. Offside, Bolton Wanderers. Darren Pratley tries a through ball, but Josh Vela is caught offside. Attempt missed. Conor Washington (Queens Park Rangers) left footed shot from the left side of the box misses to the left. Assisted by Massimo Luongo. Substitution, Bolton Wanderers. Craig Noone replaces Adam Armstrong.